As your company grows or changes, so does the complexity of managing your performance systems and processes. Unfortunately many organizational systems suffer from one of two conditions as a consequence: underdeveloped and fragmented or bloated and burdensome. Either way, the result is ineffective and misaligned performance systems and processes that don’t support – and potentially work against – your ability to direct and motivate performance consistent with your business goals and values. 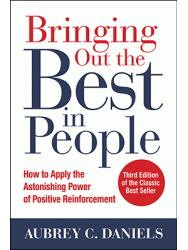 From training for training’s sake, to infrequent and unactionable feedback, to the dreaded annual performance appraisal, organizations often neglect or passively tolerate problems that seem too daunting or controversial to fix. Whether it’s designing performance systems from the ground up or calibrating and aligning your existing systems, ADI has the science-based expertise to ensure that they are practical, equitable, and support the performance that matters to your organization. We eliminate the behavioral disconnects, build in positive reinforcement for the behaviors required for sustained implementation, and calibrate your systems and processes so that they work together to support your short- and long-term goals. Performance systems and processes are powerful tools for directing and motivating performance. Let ADI help you accelerate your business performance by putting your performance systems to work for you.